We have 3 offerings for prospective students! An introductory beginner course for machine and bamboo tattooing and an offering for those already experienced wanting to practise existing skills. The beginners “course” like all our offering gives you a casual environment to learn the basics of tattooing. Learning tattoo at best can take many years so what we have developed here is a great way to see if this really is the career path you want to take. Basic drawing skills are necessary. Students will be expected to take initiative and practice the given instruction as much as possible. The beginner course is 2 weeks long (10 days) all materials are supplied. Up for a real challenge? Interested in the traditional hand poke tattoos known as Sak Yant? Sometimes called bamboo tattoos the traditional thai tattoos are an amazing part of the culture of the region. Learn in a casual environment from a real Sak Yant master. Receive basic instruction and the opportunity to work on these teachings in our relaxed school studio. Be instructed on the basics of “bamboo” taking including drawing stencils, preparing equipment, setting up workstations and basic hygiene and safety. After working on fake skins have the opportunity to tattoo models. The bamboo course is 4 weeks lone (20 days) all materials are supplied. Return students and existing tattooers can come to us and enjoy our easy going and relaxed studio environment to continue working on their skills. Enjoy a holiday in awesome bangkok and work on models during the week. Hang out at the studio with fellow tattooers! The school is a friendly and casual place to be and learn. There are many aspects to learning tattoo so the course is designed to be relaxed and enjoyable as well as informative. Many people come to learn with us from all different backgrounds and skill levels and everyone enjoys their time here. The following document will give you some information on how we roughly organise the course. We understand everyone learns at different speeds so the schedule is not set strictly and will depend on you! Many of the steps outlined here we actually go over very often. The tattoo process is exactly that, a process. When you understand it you will find you can make tattoos yourself! 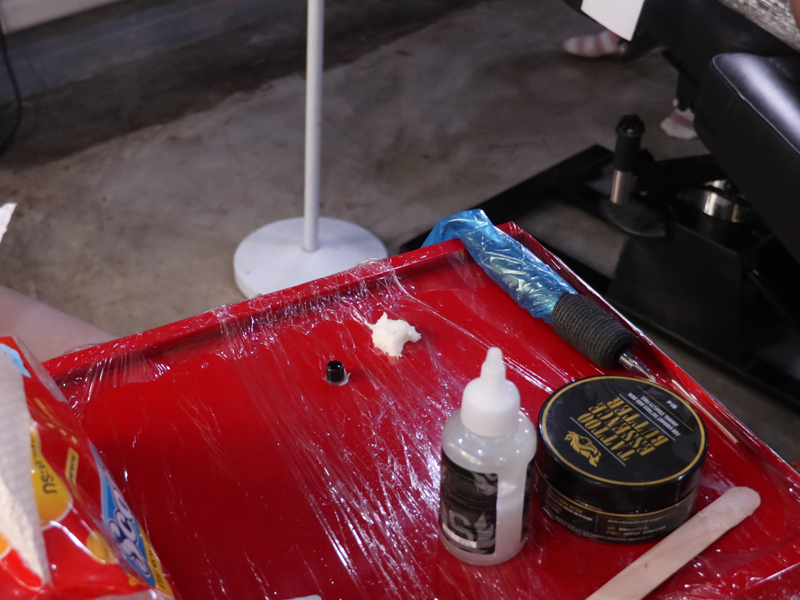 You are shown how we make our stencils that we use to tattoo. A stencil is like the tattooist road map and therefore very important part of the tattoo process. We teach you to make the stencil by hand as this is the best way to help you understand the design. Stencils can also be made by special printers. The workstation and how it is organised can be a very personal thing. We show the way our artists setup and explain why we do it. Many people find their own way and that is great so long as it is clean and organised. The tattoo machine is an amazing little thing but can also confusing to someone new to them. Not only are there many types but also many different configurations. We start you on what’s known as ‘coil machines’. You will also be shown other type of machines such as ‘rotary machines’. Now you can put what you have learnt to practice on the fake skin. Often you can tattoo as much as you want until you feel comfortable. The fake skin can be difficult to make beautiful tattoos on but it will teach you the process. You should spend at least 4 days on the fake skin before moving to models. So now that you can confidently tattoo an innocent fake skin you will put it all into practice on the models we provide. Please understand that you are learning and be very patient with yourself and important the instructor and models. You will have almost all day to tattoo so you never need to feel rushed and can take your time. The models generally choose the designs themselves from the internet. We always try to get them to choose according to your skill level the longer you stay the more advanced work you will do. You now will work in the studio with the other artists and experience the full running of a tattoo shop. You will be assigned your own workstation and tattoo chair. You are expected to keep your area clean, tidy and respect others. You will tattoo 5 models a week, Monday to Friday. The more you do the more you learn, as there is so much information you must pace yourself or risk overloading! Luckily Bangkok has many things to do to relax after a stressful day! The course is casual yet instructive. 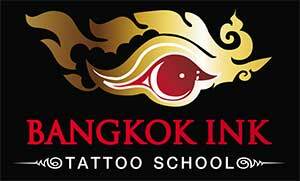 Most importantly we want you to enjoy your time with us and hopefully gain the amazingly rewarding skill of tattooing! Have more questions? Head over to our FAQ page and see if the answer is there!